Striker Kym Harris bagged himself a double as Adelaide Blue Eagles brushed aside Adelaide City at City Park on Friday night in Round 1 of the PlayStation4 National Premier League. 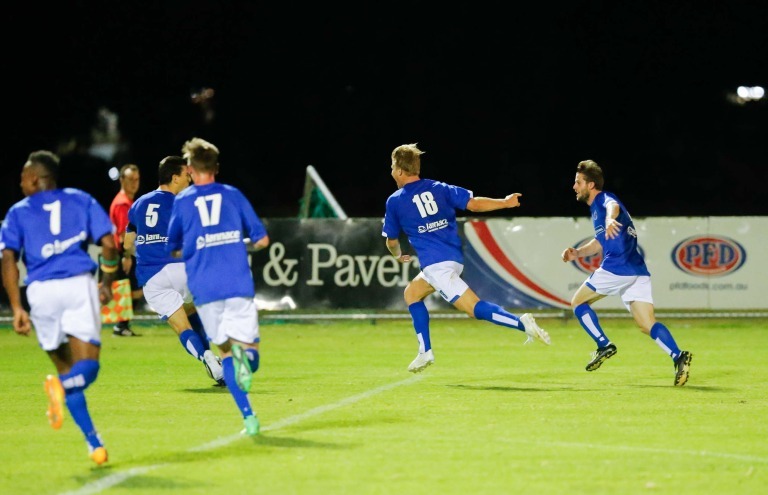 Blue Eagles captain Chris Annicchiarico was happy to walk away with the three points, but says that the side are now focused on this week’s encounter with Modbury Jets. We had the better of it and created some good chances and we took our opportunities, but we played well on the whole and it was a competitive battle. To City’s credit they were pressing pretty hard for the equalizer, but I was happy with the boys’ response to the goal. Damien Cretteden opened the scoring for the visitors early on in the first half, as his sublime strike from just outside the 18 yard box neatly nestled into the top corner. City keeper Ryan Veitch could do nothing but watch as the ball sailed into the back of the net. The two sides entered halftime with Blue Eagles a goal to the good in a tight contest. City managed to claw their way back into the contest, largely thanks to the efforts of substitute Marco Mittiga which gave the home side some momentum. Both of City’s best chances came from Mittiga, as his long range volley from a long way out forced the best out of young keeper Michael Catford. Shortly after, Mittiga was denied by the crossbar as he met fellow substitute Josh Mori’s cross with a pin point header. The equalizer did eventually come for City, as Nic Bucco’s curling delivery struck the goalframe and feel to the waiting feet of Captain Matthew Halliday for an easy tap in. That was a close as the home side got, as Kym Harris gave the visitors back the lead shortly after with a free kick that sailed straight into the top corner. Harris was involved for Blue Eagles third goal, as he forced a save out of Veitch that could only have been palmed onto the crossbar. 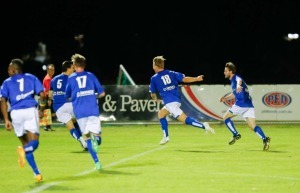 Yvan Boyokino arrived late into the box and calmly slotted home the rebound. To cap off a memorable night for Blue Eagles a penalty was awarded to the visitors in the dying minutes of the game, which Harris calmly converted for his second.